The death of on Friday, 4th November, 2016 touched many Nigerians especially in the role he played in the fight against insurgency in the North east. Born on 15th August, 1980, Lt. Col. Muhammad is a recipient of the Chief of Army Staff Award for exceptional bravery and excellence after he led the army units that recovered Gamboru-Ngala, Baga and several communities from the terrorists and was given accelerated promotion over his peers. home located on Jabi road in Kaduna on Sunday. “There have been several attempts on his life and they have always been ambushed, yet the military authorities still left him there until he was killed”, late Muhammad’s immediate younger sister Amina says as she mourns her brother. Mohammed is a son to all; this is a young boy who did not differentiate between anybody especially coming from a polygamous family. He does not differentiate between his own siblings and siblings from another mother. I hate to say ‘was’ when I am talking about him, but he was the unifying factor of this family,” Muhammad’s step mother, Hajiya Nana-Aisha said. She added, “When he was posted to Yobe state, he called me and told me that he had been posted to the war zone and asked me not to tell his mother. When he was again posted to Maiduguri in Borno state, he called me again and told me where he was in case of any emergency but also instructed me not to tell his mother, that is how close we were. What can I say about Muhammad that has not already been said, he was a very religious person, he was always in the mosque praying and fasting. He never behaved like a military man, as he was always humble and quite. I am encouraged by what he did because at one time, I asked him if he was not overdoing it in the north east and he said ‘someone must do it’. I guess he decided to be that person,” Mohammed’s elder brother, Abdulaziz said. Slim, as we fondly called him is a hero, he was a very honest person. He has been a rallying point especially for members of the 50th Regular Course. We call him our boss when he was promoted, but did not want us to call him that. 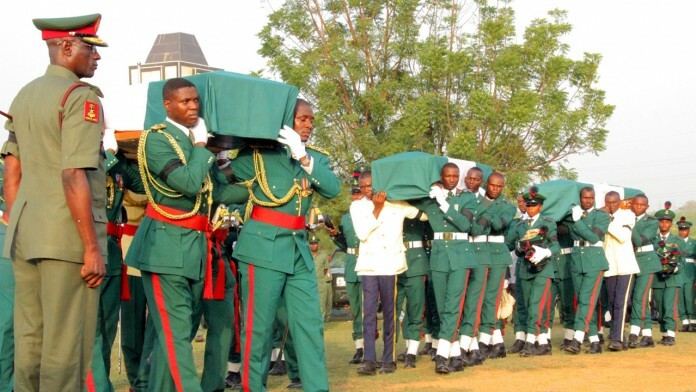 When he was deployed to the north east, he had no fear in him because he was optimistic that with the right equipment Boko Haram is “a small thing,” some of his course mates who pleaded for anonymity said during their condolence visit to the family. 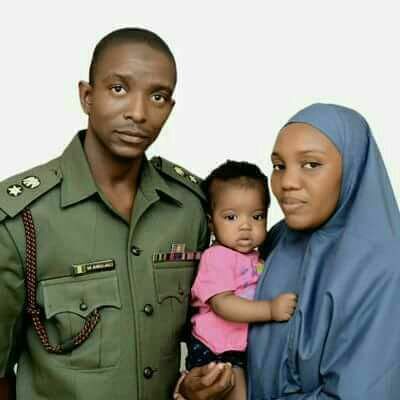 Lt. Col. Muhammad Abu Ali is survived by his wife Samira, their three children Mimi, Abba and Yasmin, his father, the Estu Bassange of Kogi state, Abu Ali, his mother Hajiya Fatima, three other mothers and 20 siblings. He is a member of the 50th Regular Course. He joined the Nigerian Defence Academy (NDA) in 1998 and was commissioned on September 27, 2003. He was described by his colleagues as a gallant and brave soldier. He participated or even led many major operations in the North East, including the liberation of Mubi and many other towns from the hands of Boko Haram. 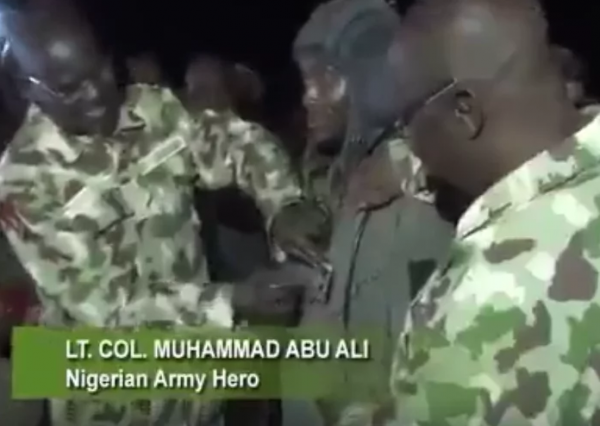 He enjoyed an accelerated promotion from the rank of Major to Lieutenant Colonel and was decorated by the Chief of Army Staff, Lieutenant General TY Buratai at Gamboru Ngala on 9th September 2015 during an operational visit. He did YOC Armour, YOC Infantry, Platoon Commander’s Course, Tank Auto Instructor’s Course, Junior Divisions Course, Scorpion Conversion Course, Command and Staff Officers Operational Skills Corps. He participated in the United Nations Mission in Liberia (UNMIL), United Missions in Darfur (UNMO), among others.